Confession. I'm such a huge nerd for the creepy new Netflix original series Stranger Things. I love the sci-fi genre anyway, but throw in all of the 80's period specific detail and I'm a total fangirl! Its visuals evoke feelings of 80's movies past: E.T., The Goonies, Stand By Me, and so many others. I recommend watching it if you're into nostalgia and don't mind being creeped out. 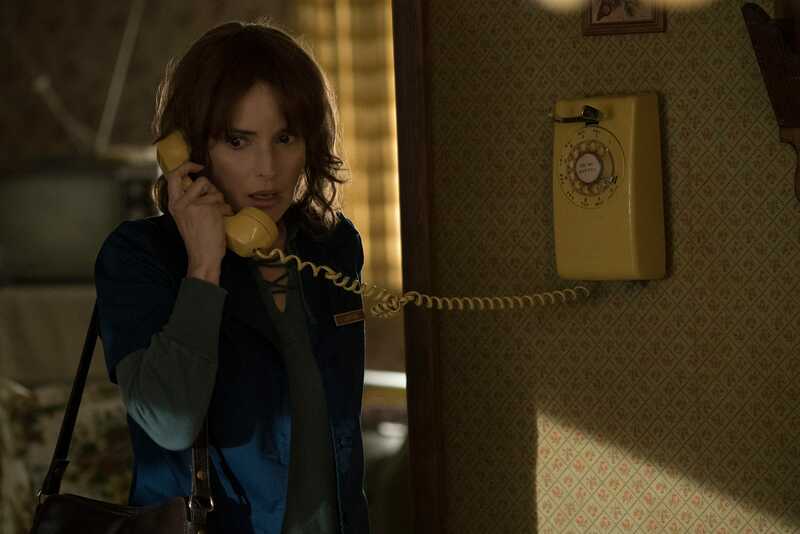 Plus, Winona Ryder's constant panicked face gives me LIFE. There are so many cool references that I could have included from the show, but I chose the ones that spoke to me the most for this cake (and ones I considered to be less spoiler-ish). 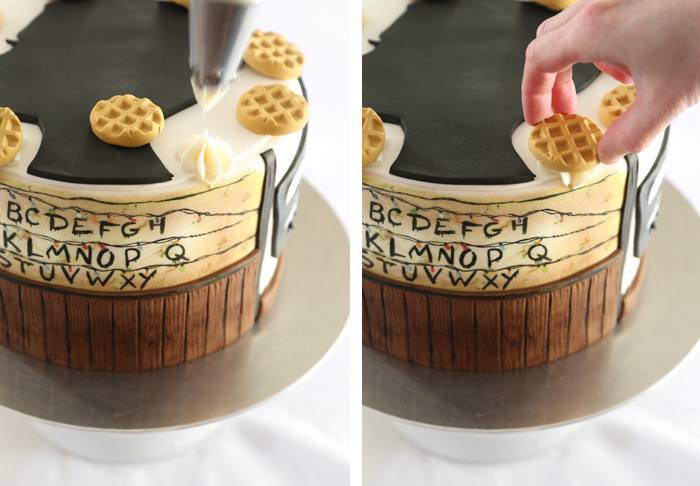 I guess you could say that I made this cake for myself, but I hope other Stranger Things fans will love it, too. The wall! 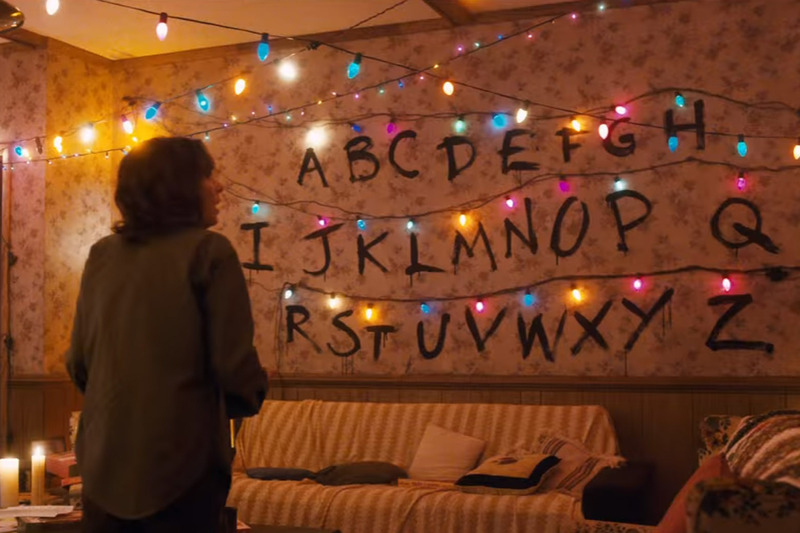 One of the characters in the show can communicate by manipulating Christmas lights. I had a lot of fun painting this part of the cake - and if you've been hanging around here for very long then you KNOW I love an animated GIF. I made this one as homage to one of my favorite creepy scenes where Will is telling his mom to RUN! Eeee! 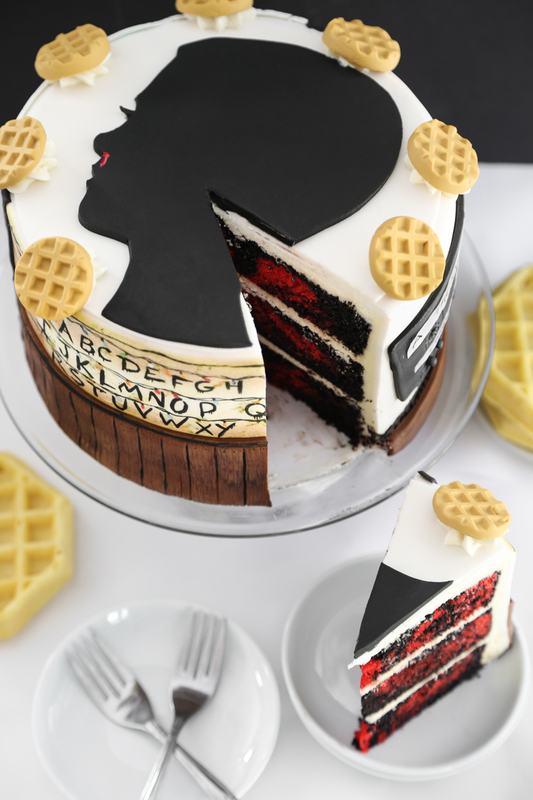 This side of the cake illustrates The Upside Down, which is a parallel dimension inhabited by something very frightening. It's a dark reflection of our world. It looks cold and eerie with spores floating in the air. Oh, 80's music, how I love thee. There's a scene in the show where The Clash is playing, "Should I Stay or Should I Go" and it so perfectly suits the terrifying situation that's playing out. I decided to make a fondant cassette tape to represent this scene. The labels are made of edible wafer paper and food writers. This cake starts with one of my favorite black velvet chocolate cake recipes, and then it's marbled with red velvet. This was my nod to the red-on-black title screen. I'd planned something entirely different for the cake's interior at first. I wanted to recreate the dim blue-teal atmosphere of The Upside Down, but the baked cake layers turned out looking more like an Earth Day cake with brilliant swirls of blue-green. But, hey! That's how creativity goes sometimes. I'm kind of glad it didn't work because the black and red marble is so striking, especially in person! Now for the tutorial. This may be a bit lengthy but I'll try to be as concise as possible. First, you'll need to level the baked layers and cover the cake in white fondant. I frequently recommend this tutorial and this one, especially if you are a beginner. 1. Make the wall. You'll need about 4 ounces of chocolate fondant, kneaded and rolled flat on a piece of parchment or waxed paper. Using a paring knife, cut an 8.5 x 2.5-inch piece from the fondant. Use a skewer or toothpick to striate the piece to look like paneling. Use the tip of the skewer to punch 'nail holes'. 2. Dust the piece with dark cocoa powder using a small dry artists' brush. 3. 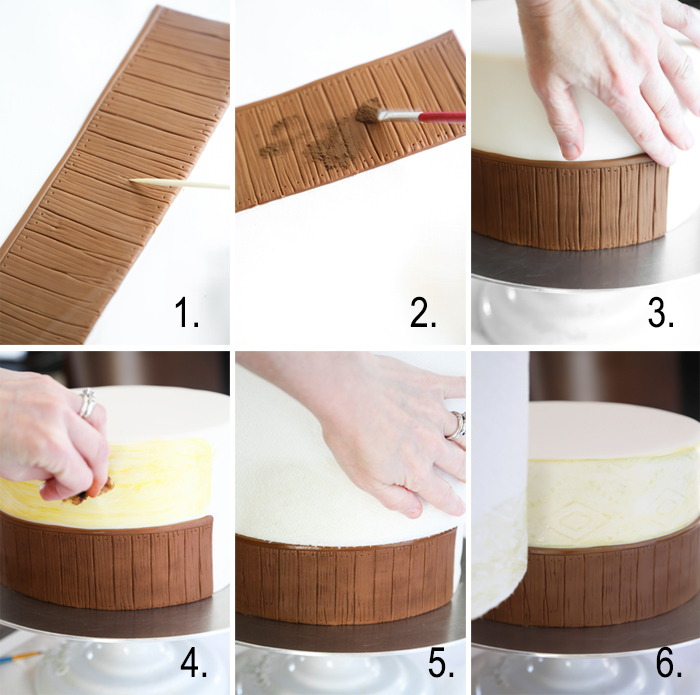 Use dots of light corn syrup on the undecorated side and adhere the fondant piece to the bottom side of the cake. 4. Use a small, barely damp sea sponge to apply food color to the top half of the wall. Dilute 1 tiny drop of yellow mixed with a dot of moss green gel food color in clear vanilla extract for the wall color. 5. Press a patterned paper towel over the food color paint (avoid patterns that include brand names). 6. Lift the towel away to reveal a 'wallpaper' pattern. 7. Tear away a tiny piece of a sea sponge and dip it in undiluted moss green food color. Press it onto the cake to create a leaf pattern. 8. Using a fine tipped artists' brush, paint on dots of rose gel food color to add a floral element to the wall. 9. Use the same brush dipped in undiluted black food color to paint the letters onto the wall. You can find several examples of the wall online (like this one) as a guide. 10. Dilute a little of the black food color in a drop of clear vanilla extract, use the fine-tipped artists' brush to paint the Christmas light wires above the lettering. 11. Use a large, soft dry art brush dipped in dark cocoa powder to create a darkened vignette around the edge of the lettering. 12. Paint black lines on the chocolate fondant to make the paneling more realistic. Brush the entire paneling piece with dark cocoa powder. 1. Make The Upside Down. Roll and cut a black piece of fondant in the same way the chocolate fondant was cut for the paneling piece (8.5 x 2.5 inches). 2. Use blue gel food color mixed with white liquid food color to paint tree trunks with upward stretching limbs on the fondant. Dip a barely damp sea sponge in the paint and pat it on the limbs to create leaves. 3. Dip a sturdy flat head art brush (about 1-inch wide) into the paint mixture and then flick it onto the fondant by bending the brush head back with a finger and then letting it go. This creates the floating motes you see in The Upside Down. 4. Turn the fondant piece upside down. Attach it to the bottom edge of the cake with dots of corn syrup on the back side. 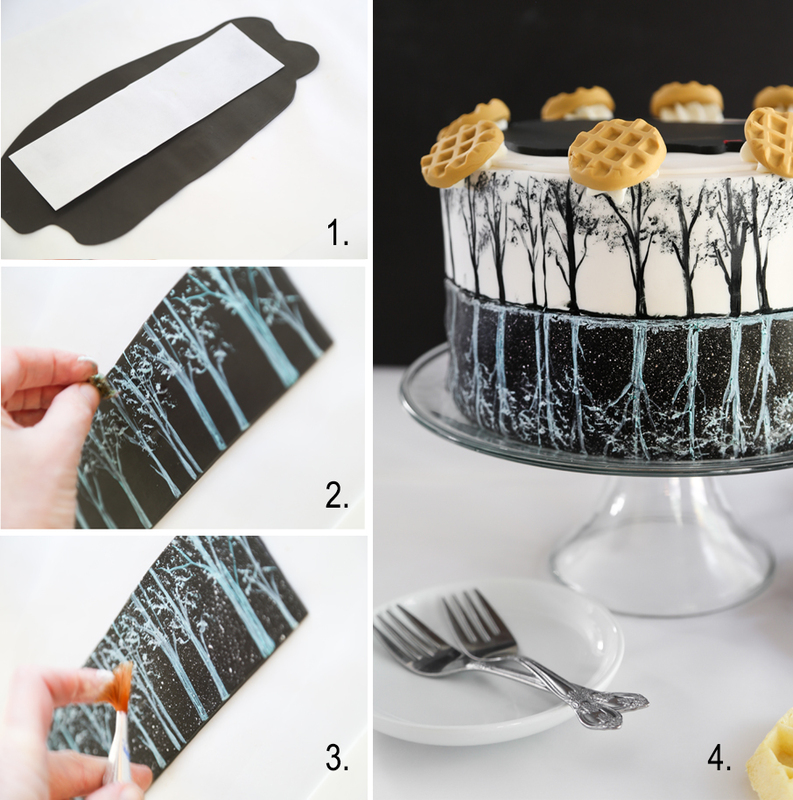 Paint tree silhouettes upright on the white fondant in the same way you painted the blue trees, except use black gel food color barely diluted in clear extract. A quick note about the cassette tape! As you can see, I used an actual cassette tape to make an impression into fondant. Please make sure the cassette tape is clean before you use it, because most have been gathering dust for decades. Prep it by wiping it down with a soapy cloth, then go over it with an alcohol pad. Get in any nooks and crannies that might be harboring debris. 1. Make the cassette tape. Ask your mom or dad for an audiocassette tape, and then laugh about how old they are. Or, if you're me, select one from a box in the attic. 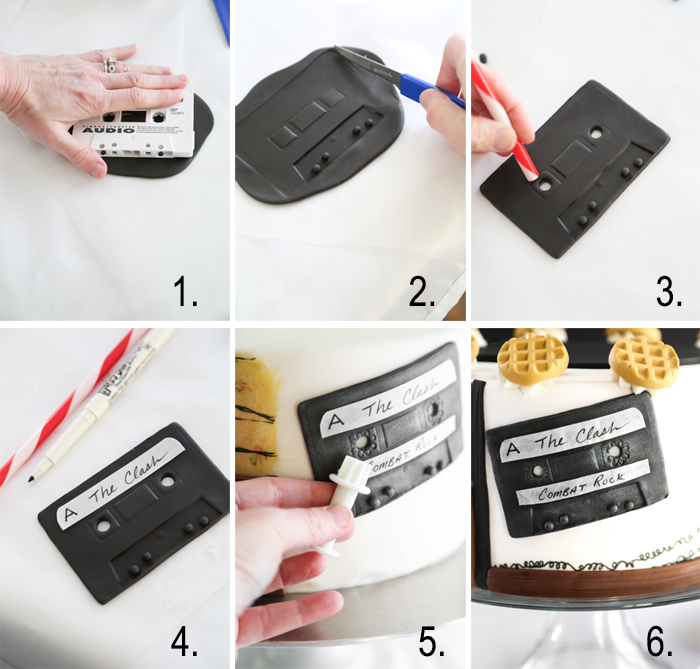 Roll a piece of well-kneaded (non-sticky) black fondant to 1/2-inch thick, and then press the cassette tape on top to make an impression. 2. Lift the cassette tape away to reveal the impression. Use a small paring knife to cut out the cassette shape. 3. Use a drinking straw to make the reel holes. 4. Cut two small pieces of edible wafer paper for the labels. Use a food color marker to write the names of the band and album name. You could label this as 'mixtape' instead to stay truer to the show. Attach the labels with a light coating of corn syrup on the backs of the papers. 5. 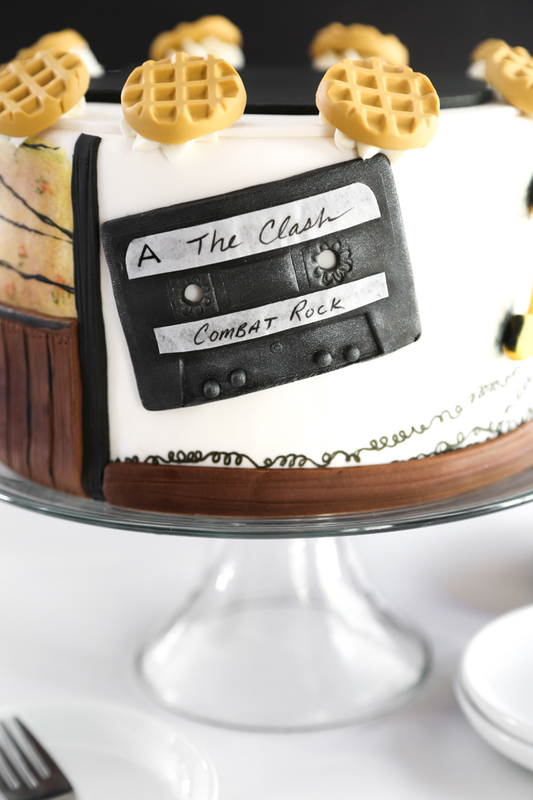 Attach the cassette to the cake using corn syrup on the back. I used a small fondant punch to create a track pattern around the edges of the reel holes. This is optional, as not everyone will have this. 6. Dust lightly with silver luster dust - again, this is optional but it makes the details of the impression clearer. 1. Make the phone: The yellow rotary phone that becomes charred due to supernatural activity is a total throw-back and I love it! 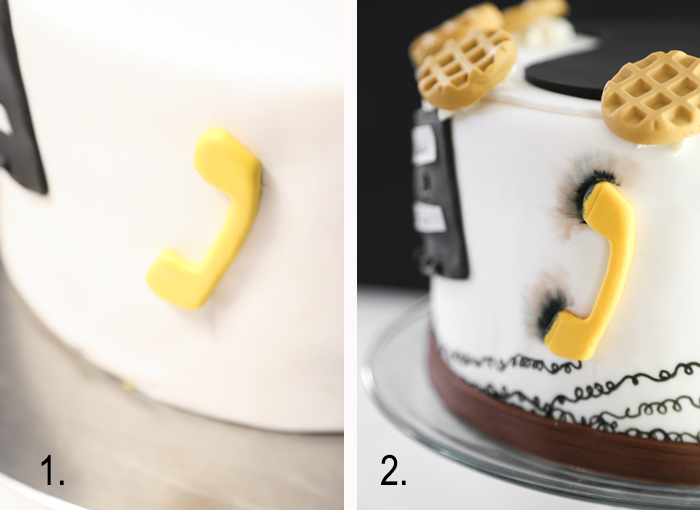 Cut a yellow piece of fondant free-hand into the shape of a receiver, and attach it to the cake with corn syrup. 2. Dry brush cocoa powder and black gel food color onto the transmitter and receiver to make it look as if it were burned. Ue the food color marker to draw haphazardly winding phone cords. Make Eleven! Eleven is the central figure of the show. She's got telekinetic powers, and she's gentle and powerful at the same time. At first I really wanted to paint El in her sensory deprivation pool on top of the cake, but since quite a bit of time and effort had gone into painting the paneled wall portion, it seemed more accessible to go with a simple but effective design. First, you'll need to print this template at 100% (and please forgive me for such an unpolished template - it gets the job done). 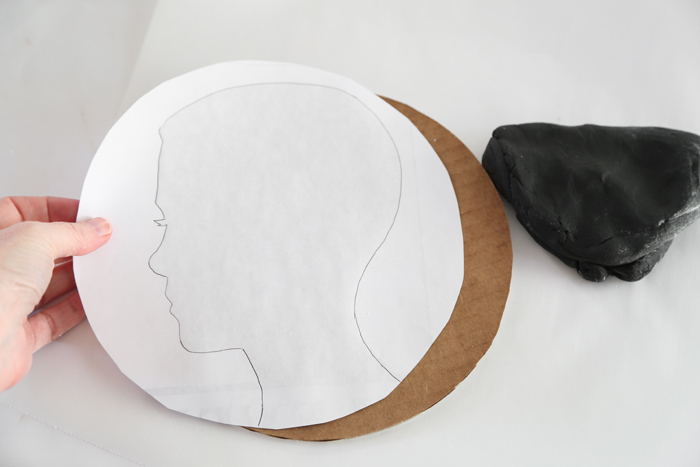 Cut the template out to an 8-inch circle. 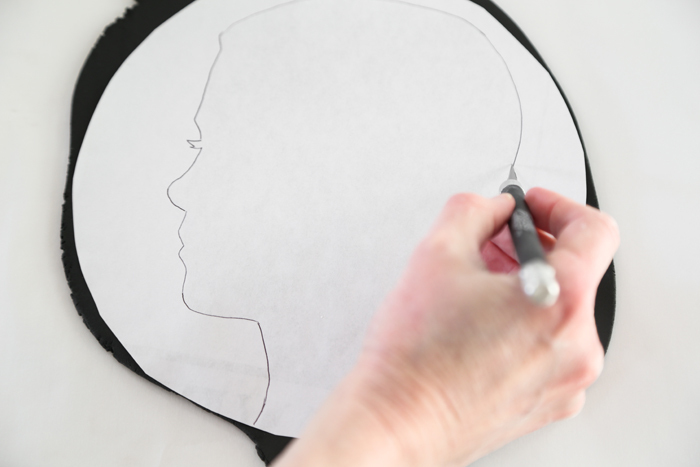 Roll a large piece of black fondant to greater than 8-inches round. Place the template on top. Use an X-acto knife with a new blade to cut around El's head. Remove the excess fondant. Place the cut-out on top of the cake, again, you can adhere it with corn syrup. When El uses her telekinetic powers, it taxes her physically and she bleeds from her nose. Mix red gel food color with a little white liquid food color and place a small amount just under the nose on the cut-out. 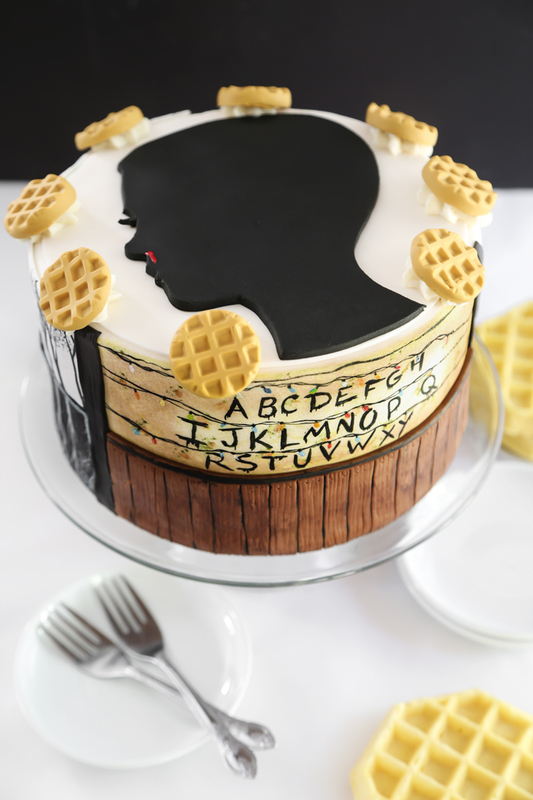 Eleven has a thing for Eggo waffles! 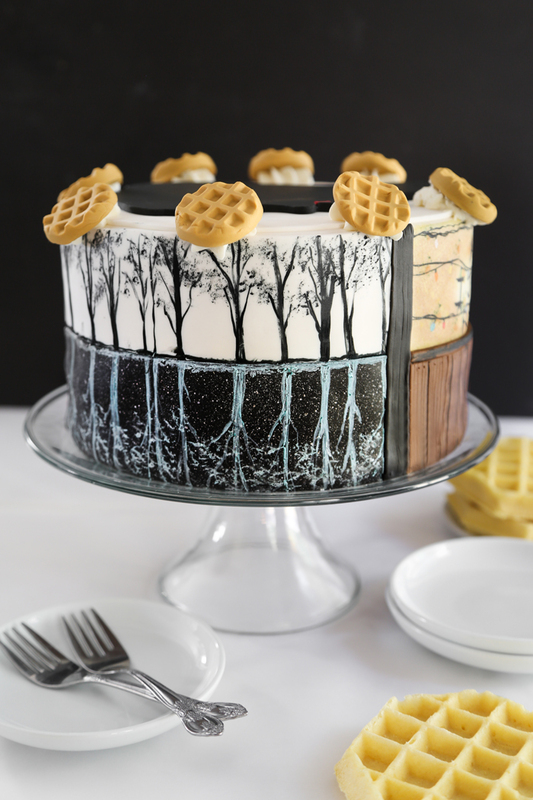 I'd bought this silicone waffle mold with the idea to make maple-filled chocolates, but I found it was perfect for making little Eggos for the top edge of this cake. Knead white fondant with golden yellow and brown food color to achieve the waffle color. Press the fondant into the mold and remove immediately. 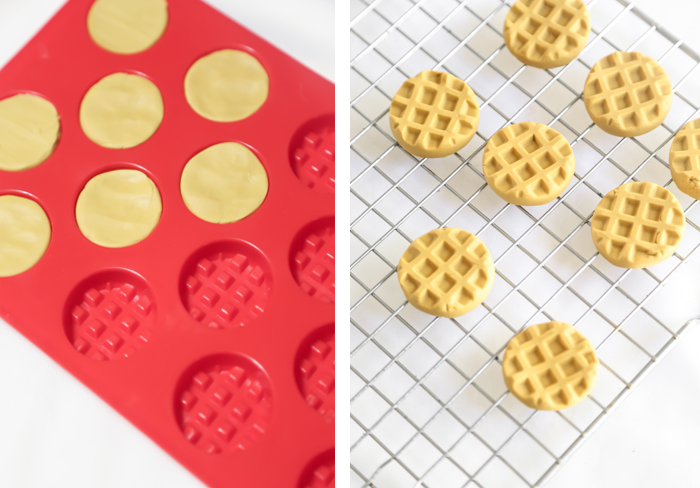 Let the mini waffles air dry for several hours before applying them to the cake. Pipe buttercream stars around the top edge of the cake, and place the waffles on top. If you've stuck with me through all this instruction - THANK YOU! I hope you've enjoyed the tutorial as much as I enjoyed making the cake. 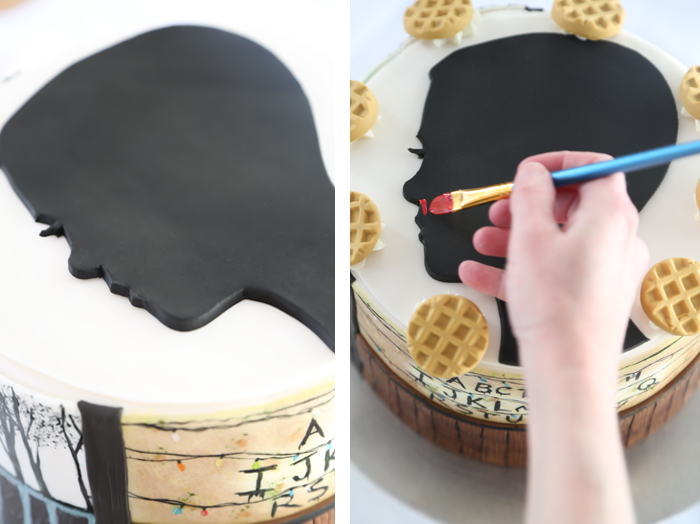 It's quite an endeavor, but if you don't want to decorate the whole cake, the lighted wall and Eleven silhouette is easy enough. Don't let all the decoration fool you into thinking this cake isn't tasty - it's one of my favorite velvet cakes, ever! It has a wonderfully delicate crumb and rich chocolate flavor. I'm including the recipes for the cake layers below along with a link to my favorite vanilla buttercream. 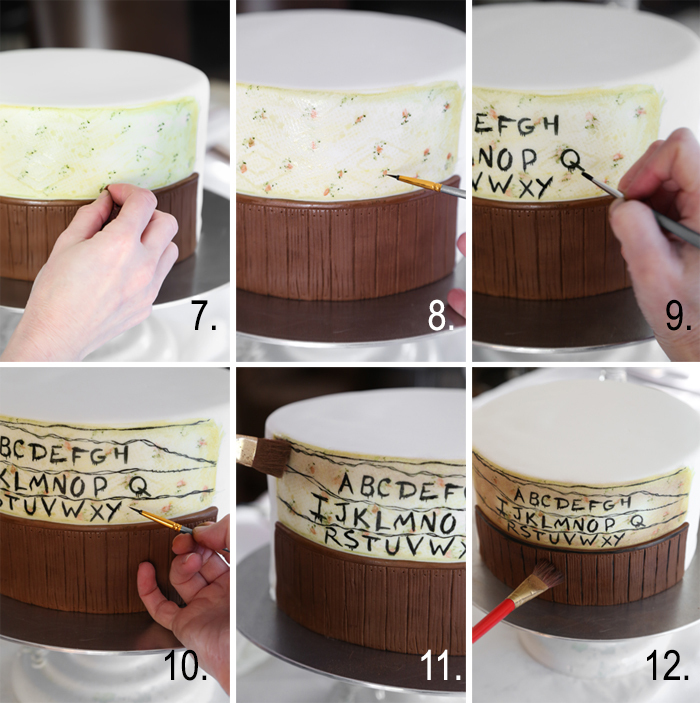 Use this cake as the base for the Stranger Things Cake. You’ll have a little bit of red velvet cake batter left over, which can be made into cupcakes if you desire. Use this American Buttercream to frost the cake, and 1 lb. white ready-made fondant to cover the cake. See blog post for complete Eleven cake tutorial. Black velvet cake: Preheat oven to 350 degrees. In a large bowl, combine flour, sugar, cocoa, baking soda, baking powder and salt. Make a well in the center and pour in the eggs, coffee, milk and oil. 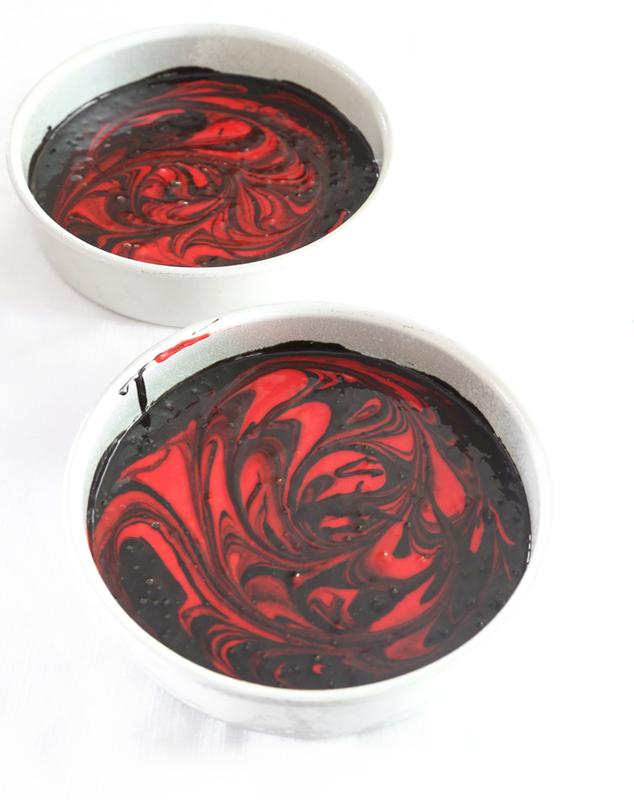 Mix in the black food color; batter will be thin. Set aside. Red velvet cake: In the bowl of a stand mixer, combine butter and sugar until fluffy. Add the eggs and vanilla. Mix well. In a small condiment cup, stir together liquid food coloring and cocoa powder until smooth and then add to the butter mixture. Sift together flour, baking powder, and salt. Add flour to butter mixture in three additions, alternating with the cup of buttermilk. Begin and end with flour. Scrape down bowl and mix well. In a small condiment cup, combine baking soda and vinegar. Mixture will bubble and fizz. Pour into the cake batter and mix until well incorporated. Bake cakes for 25-30 minutes, or until the cakes spring back when pressed in their centers. Let the cakes cool in their pans for 5 minutes before turning them out onto a wire cooling rack. When the cakes are cool, level the tops. Frost the cake as desired. Oh my gosh this cake is flipping amazing. Love it. Absolutely fantastic..her profile is her exactly..everything..kudos. I can't get over how awesome this cake is!! You're truly amazing!!! Like, WOW!!! YOU ARE THE COOLEST. This cake is incredible. This is absolutely gorgeous!! You are so talented!! Heather, this is a work of art! I adore your commitment to making gorgeous, delicious desserts. OMG! Most elaborate cake I've ever seen. Incredible work. Wish we could have one at our Stranger Things themed Halloween party this year! Your comment made my day! Thank you. Love you back! I love everything about this cake! It's amazing! This is sooo amazing! I want to have a Stranger Things Season Two release party, and have this make an appearance. How much time would you estimate to make it? 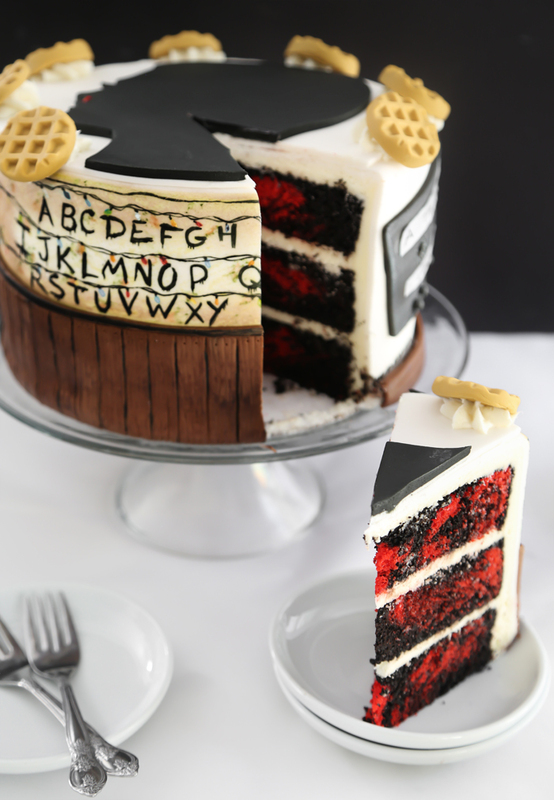 Me too, I'll start watching Stranger Things because of this cake of yours! I will make it for my grandchild who will be 14 next April. Absolutely! And I'm studying every detail on and on; may I ask you further help on how to "draw" the trees? A template maybe? they look so regular and done well, I don't believe I can do it well - and I like things perfect or almost. Please help. Thank you very very much for any suggestion. And compliments for this wonderful cake. Hi! I'm so glad you are inspired to make the cake! I don't have any templates for the trees to share. They were free-handed, and it's funny you say they look uniform because I felt they were really irregular! My advice would be to not overthink the trees and just kind of go for it with a brush and some food color. Be sure to use a little clear extract with the food color so it dries quickly. You can paint the trees days in advance but hte cassette and telephone will need to be applied as soon as you cut them out of the fondant so they are still soft and can form to the side of the cake. The finished cake can be made, decorated, and refrigerated a coule of days in advance, but I recommend storing the cake inside a cardboard box inside the refrigerator. The cardboard will help absorb the humidity in the refrigerator so it doesn't break down the fondant. Good luck! Thank you very very much, I will do this way. Excuse for the 2 messages, I had not realised the first one had been sent. Thanks again.